Camry LE, 4D Sedan, Super White, Macadamia Cloth, 7.5J x 17 Alloy Wheels, Exterior Parking Camera Rear, Power door mirrors. 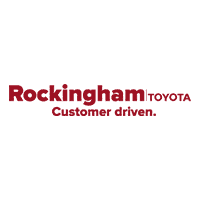 28/39 City/Highway MPG** Here at Rockingham Toyota we believe that our customers appreciate pricing that only includes standard rebates (those that everyone qualifies for). Please understand that there may be additional rebates which you could be entitled to and receive! Contact us to confirm availability and pricing! **Here at Rockingham Toyota We take our Internet Business Very Seriously!Shopping at Rockingham Toyota is car buying the way it should be; Fun, Informative, and Fair! Here are our promises:* Transparent Pricing and Sales Process- No Gimmicks!! *Pressure Free , Efficient, Friendly, and Helpful Sales Staff! *In House Team of Loan and Lease Specialists! They are Good with Numbers, and Even Better with People! Credit Challenged? Give us a try! * Massive Inventory For One Stop Shopping! * Certified Factory Service Technicians!Rockingham Toyota, Holds the Dealer Rater 2018 Toyota Dealer of the Year Award! In Addition Check Out Our Google Reviews at 4.8 stars - Highest in the Area North of Boston. Manager Special - PRICE NOT A MISPRINT - THIS MONTH ONLY ! !, Apple Car Play, Camry SE, 4D Sedan, Predawn Gray Mica, Black Cloth, Fabric Seat Trim w/SofTex, Spoiler, Wheels: 8.0J x 18 Black Machined-Finish Alloy. 28/39 City/Highway MPG** Here at Rockingham Toyota we believe that our customers appreciate pricing that only includes standard rebates (those that everyone qualifies for). Please understand that there may be additional rebates which you could be entitled to and receive! Contact us to confirm availability and pricing! **Here at Rockingham Toyota We take our Internet Business Very Seriously!Shopping at Rockingham Toyota is car buying the way it should be; Fun, Informative, and Fair! Here are our promises:* Transparent Pricing and Sales Process- No Gimmicks!! *Pressure Free , Efficient, Friendly, and Helpful Sales Staff! *In House Team of Loan and Lease Specialists! They are Good with Numbers, and Even Better with People! Credit Challenged? Give us a try! * Massive Inventory For One Stop Shopping! * Certified Factory Service Technicians!Rockingham Toyota, Holds the Dealer Rater 2018 Toyota Dealer of the Year Award! In Addition Check Out Our Google Reviews at 4.8 stars - Highest in the Area North of Boston.